I do love using Grunt Watch for all my development compiling and running automated tests. One down side when using PhantomJS with codeception however is that you need to manually spawn an instance (typically with phantomjs --webdriver=4444) before you can run your codeception tests in another window. This doesn't suit me and thus I've discovered a nice little package for grunt called grunt-run. 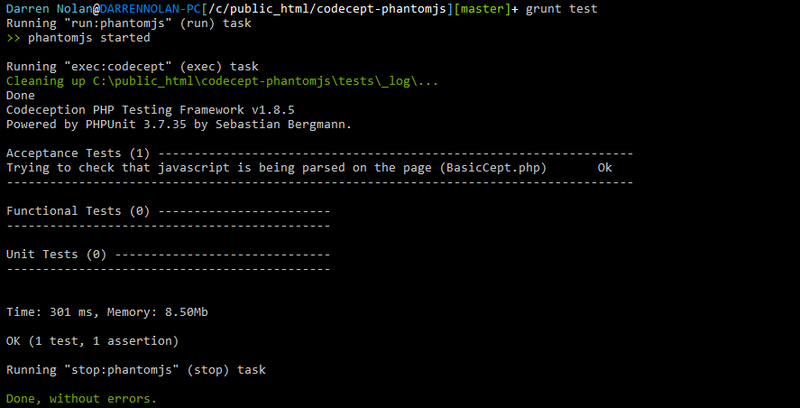 Basically when I want to run my tests, I hit grunt test - which spawns an instance of phantomjs, runs codeception, and then terminates phantomjs once codeception is finished. Here's my grunt file. First up, lets get started getting grunt on board by installing the node modules we'll be using, as well as phantomJS. By using the fantastic package for NPM PhantomJS package, the binary is automatically selected based on your current operating system (I develop on Windows and Mac, and typically test and run production on Linux) so this is perfect and ideal for all these scenarios. Install all these packages (Note that watch, less, uglify and bower won't specifically be used in this example, but they shall be in an upcoming post). In our Gruntfile.js file, we'll want to setup a task to start PhantomJS in webdriver mode, run codeception, and then close PhantomJS. // This is where we’ll trigger tests automagically. You'll notice I didn't specify where PhantomJS is. When using the NPM package to install PhantomJS, you can use some predefined details about it's location, among some other things - brought in with var phantomjs = require('phantomjs'); and var phantombin = phantomjs.path; so we don't have to worry about these things like we do with codecept. Also with calling ./vendor/bin/codecept I have it double quoted. This will work still on Mac (didn't test Linux, but it's much of a muchness) because Windows tries to execute parts of that command individually and I haven't discovered a nicer way for cross-platform compatibility. Now lets start bootstrap our codeception tests real quick (we'll get fancy with this later). Tell codeception we've changed our driver list and settings which is required when you need additional class helpers brought in (WebDriver for example). FANTASTIC. Now we can test to see this all working (without any tests). is the 'yay' message we're after). Great, now we'll start with our super basic task. Powered by PHPUnit 3.7.35 by Sebastian Bergmann. We're done! 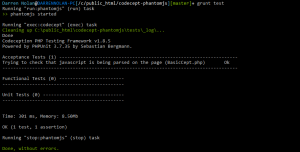 Now every time you want to test your code with PhantomJS, you can just use grunt test without having to start PhantomJS in another window. Great post – we’re moving from Behat to Codeception at the moment. Sticking point for us at the moment is driver switching – is there a post in the pipeline with that coming? I believe you can driver switch, even within the same acceptance tests. I’ll write something up on the weekend after a bit of a play. The best I’ve been able to reproduce thus far is a second acceptance suite. I’m still trying for alternatives. I have a post that’s pretty much done that shows setting up a second suite for basic plain-text tests. I’ll post that shortly, but I’m still working on the main prize.